Before coming to our clinic in April of ’08, this patient went to a well-known clinic to have a strip (FUT) hair transplant session performed. To make the situation even worse, the patient’s frontal hair line was mangled with large plugs. The patient’s goal was to repair the 5mm strip scar that ran from ear to ear (30 centimeters), minimize the appearance of the darker pigmented plugs on the front and repair the mangled orientation of the hair line. The average strip is about 3 to 4 mm in width. Some clinics prefer revising linear scars, but we prefer to graft linear scars via CIT. Grafting scars can significantly improve the appearance of strip scars and doesn’t involve producing another linear scar. We find that many patients can see a 40 to 50 percent improvement after scar grafting. Strip scars usually require more than one session and often times yield is unpredictable due to blood supply for graft survival. After scar revision, some patients can see a significant improvement, but there are some factors that cause the revision to be less effective. Some complications to consider are “stretch-back” of the new linear scar, damage to surrounding follicles, and damage of nerves. Many patients can heal well but some will not regardless of the strip surgeons skill. Dr. Cole transplanted approx. 160 CIT grafts to treat this patient’s strip scar and removed 180 plugs from the front line. We are pleased that this patient now has the ability to wear a much shorter hair style on top and in the back (donor area). it’s wonderful when it’s works! » it’s wonderful when it’s works! It’s sometimes more difficult to get growth in scars and usually virgin scalp is always better. We really don’t see strip as advantageous for any patient much less younger patients. Strip method offers so many other disadvantages while most patients believe that they will have the 1mm linear scar and that it should be pencil-thin. 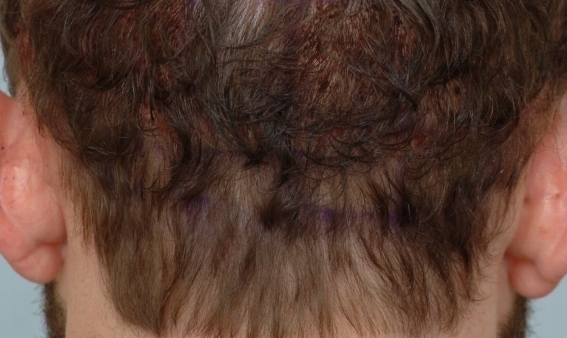 The scar may also widen over time as the scalp heals and that can skew the direction of the hair. But whatever the case may be I hope each patient know all of the pros & cons. Strip involves a deeper incision than CIT and may cause nerve damage in the process. Grafting into the linear scar may take longer to achieve a result, but usually creates a much better aesthetic result than a scar reduction. The disadvantages are that some hypo-pigmentation may occur at the extraction sites and the initial price per graft is slightly more. The hypo-pigmentation could be because of the lack of melanin. We have seen that replacing follicles (farming) back into the donor area can stimulate the production of melanin which allows pigment to return to the sites. The objective of the farming is to replete the donor area & camouflage missing scalp hair. Patients who use CIT farming are typically those who have extensive hair loss or require repair. I concur. This is a very positive result. Even until this very day, patients come to us for total removal or repair of what was previously done as early as 6 months after their bad hair transplant procedure was performed. 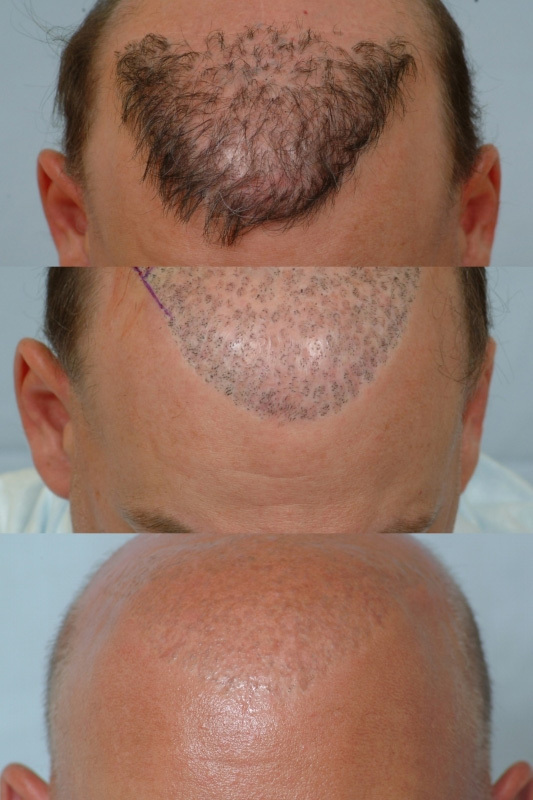 Obviously, these repair patients usually quickly notice that the transplanted follicular units are mis-angled and their concerns shift from having hair to hiding their hair. Some patients even experience how public attention can shift from the recipient area to the donor area. 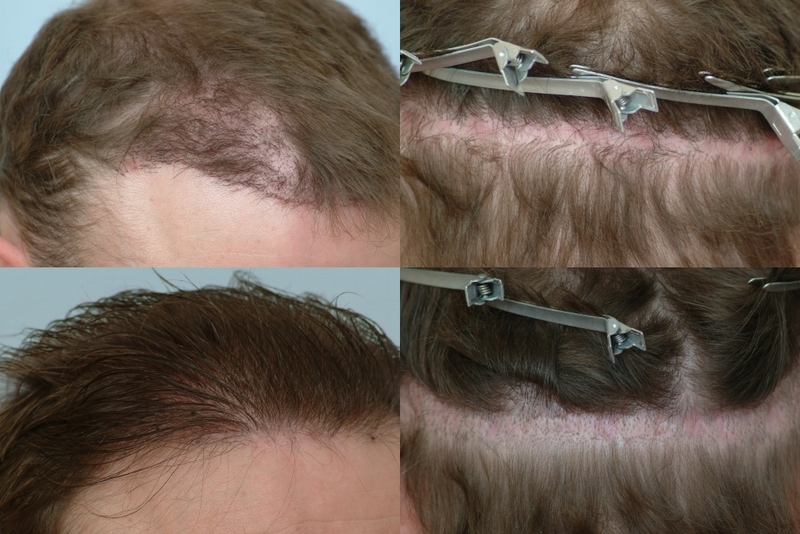 Basically, these patients have undergone hair transplant procedures to add considerable coverage to balding areas on top, but now have sparse donor areas with noticeable thinning. During consultation, we do our absolute best to educate patients about what may occur in the future. For many patients, the journey from hair loss to hair restoration can easily encompass some form of disfigurement. One positive note to remember is that there are a hand full of clinics that can make a repair patient’s quality of life 100% better through competence and innovation. Out-dated procedures (mini grafting, strip (FUT) method harvesting, and scalp reductions) performed by many of today’s larger clinics view younger, uneducated patients as sitting ducks. In the end, non-strip methods enable patients to wear a shorter hair style and produce better aesthetic results in patients’ donor areas. You can see from his before photos that his case was very complex and required major repair. His donor density was extremely low due to his hair transplants from the 80s disabling him from proceeding with hair restoration. At 42 years of age, he decided to do a full day of repair and a couple small sessions of repair to become naturally bald. 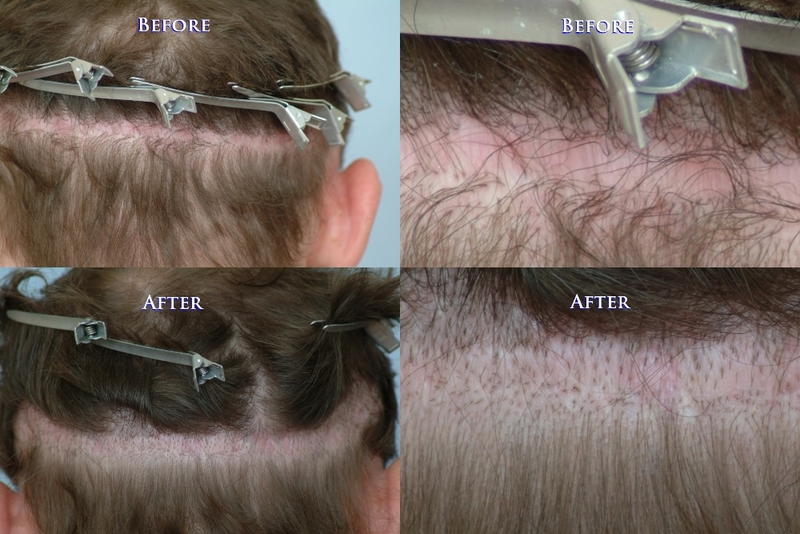 The repair involves dividing groups of large (4 to 6 hair) follicular units then placing these smaller units back into the original donor area from where they were originally taken. The patient’s goals are now met and he is overly pleased with his new appearence. After two years and hundreds of redistributed plugs later, his “The pluggy look is out and the new natural look is in” days have come.